New Blank Document is Lamington Drive’s in-house artwork reproduction facility. We offer a simple and restrained selection of materials and processes which in turn allow for the most cost-effective and efficient outcomes, without compromising on exacting quality. Risograph duplication on Australia’s only A2 Risograph. Vinyl Cutting & Plotting, up to 760mm wide. All NBD services are undertaken by trained staff directly at our Collingwood HQ. For more detail on our services, including pricing, please scroll down to the relevant section. Our full website including file setup guides will be launching soon. The Risograph is truly a miracle of a machine. It basically is a screenprinter inside a box that looks like a photocopier. How it works is truly magic. In many ways it’s the absolute opposite of a Giclee Print, but has its own distinct charm and cult following by combining the a more organic look and feel of hand-printing, with the technological advances of high-speed duplication. With most Riso Machines only printing up to A3 in size New Blank Document is proud to own and operate the only A2 Riso in Australia. Making Riso prints is a unique experience. Working one colour at a time, the machine creates a ‘master’ on a heat-sensitive plant-fibre based screen. This master then spins around a drum at speed, while soy-based ink is pushed through the drums, onto the paper. This all happens inside a giant beige box with little to no waste or mess. The results are often very rich and uniquely textured, and depending on how you layer the colours and separate the artwork, can be suitable for an incredibly wide variety of uses ranging from artist books and limited edition prints, to high volume catalogue or poster printing. All Riso print orders are checked for roller marks and lightly touched up before packing as required. Because of the typical high print run and unwieldy nature of A2 paper, we cannot guarantee safe transit of works in the postal system therefore shipping is not currently available, and all orders must be collected from our studio in Collingwood. If you require custom stock, we can arrange through our supplier Ball & Doggett. For this we require an additional lead time of 3 business days to allow for delivery. Wholesale printing and studio access / printing workshops coming soon. Our pricing table is shown below. Please note that we are only offering non-bleed sheet printing at the moment, and all prices are ex-GST. Because of setup time + wastage, our minimum is qty 50 copies for A2 and qty 100 copies for A3. If you require fewer copies please contact us as we may be able to accomodate, with an additional set up cost. Or perhaps a giclee print may be a more effective option. 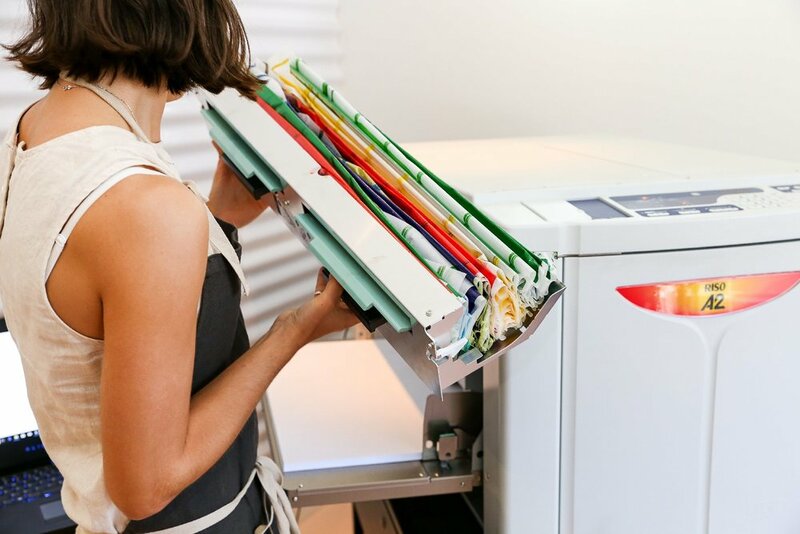 Due to the inherent imperfections of Riso printing, it is vital that you read our file setup guide and checklist especially for first-timers. Turnaround times vary depending on number of inks used and complexity of image. More ink = more drying time. Allow for at least one day per colour for overnight drying. Payment in full is required before dispatch of goods. We accept all major credit cards, EFT, Paypal, and Cash. 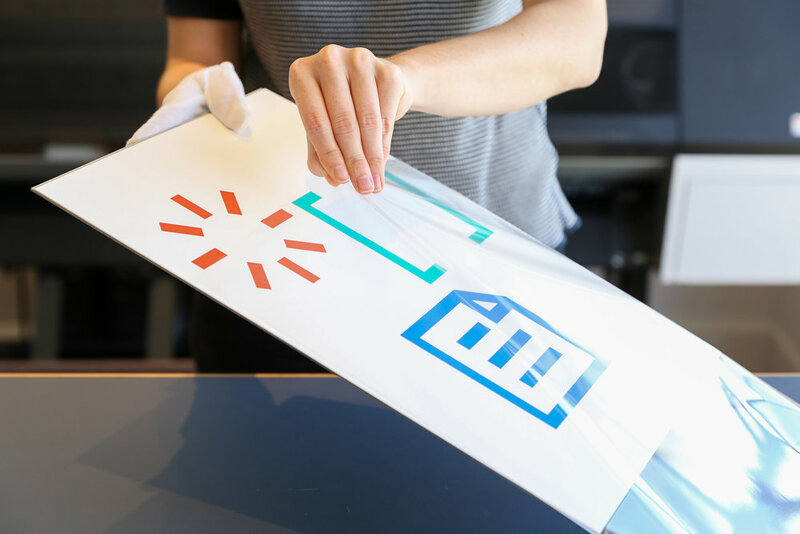 From short-term application such as gallery wall-text and exhibition graphics, to more permanent uses such as decorative stickers or signage, New Blank Document offers a basic Vinyl cutting service which can handle roll media up to 762mm wide, and up to 50m long. Our house stock is Avery Dennison 700 Series Premium Vinyl Fi lm adhesive. Up to 8 years durability. The adhesive in the material is 64 micron polymeric calendered film and meant for Flat sided trucks, cars & vans, Architectural & directional signage, Window graphics, Point of purchase, Indoor & outdoor advertising surfaces. The adhesive is rear-mounted, meaning that it is applied on top of surfaces for right-reading application. For larger orders, other colours and finishes can be arranged. 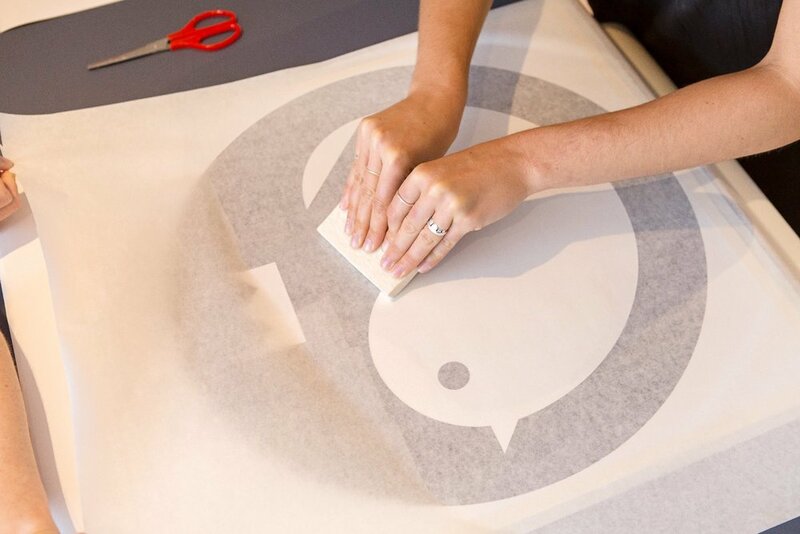 Our plotter is also capable of creating pounce patterns on 90gsm pounce paper, as well as plotting with pen or pencil. Contact us for further detail. 2. The weeding and transfer tape application process will be charged at an additional cost in 5 minute increments at $75.00 per hour. All jobs will receive an estimate within one business day of enquiry. Note: Our maximum width is 70cm, with variable height capabilities. Our cutting program will only work with vector artwork. Please view our file setup guide and checklist for details on how to set up. Turnaround times will depend on the day of the week that artwork and order are received. Most orders can be processed within the same week. Payment in full is required before dispatch of goods. We accept all major credit cards, EFT, Paypal, and Cash. Giclee printing is a fancy word for digital inkjet prints. There’s an accent over the ‘e’, and nobody truly knows how to pronounce it properly, so don’t sweat it. At NBD, we run a very handsome and enormous Epson 9900 Stylus Pro, which allows us to create prints up to 44” or 112cm wide, and up to 12m long. We use only genuine Epson UltraChrome K3/HDR inks, which offers an exceptionally wide colour-gamut by utilising a 10-colour ink system, with lightfastness ratings up for 75 years for colour work. Our current house stock is 315gsm Canson, Arches Velin Museum Rag for anything up to A2 in size or 290gsm Moab Entrada Natural Ultrasmooth Fine Art for large-scale prints. This has been profiled to generate the most accurate results out of our RIP - i.e, the software that sends your images to the printer. Please note, for orders larger than qty 5 prints in any given size (A4-A0), we only offer one stock option, 290gsm Moab, which we would print via the 44” roll. 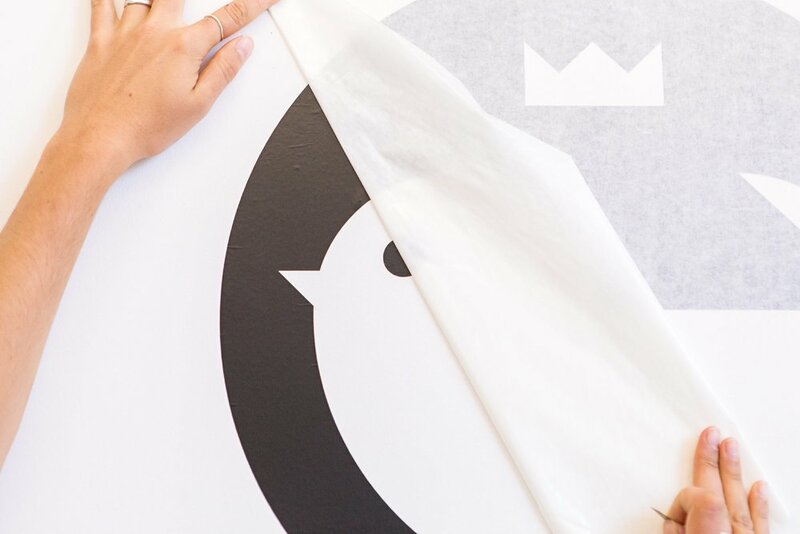 For larger quantity orders printed on the roll, all prints are flattened overnight and then packed into archival mylar or tissue paper depending on the size. Postage and drop-shipping services are also available. 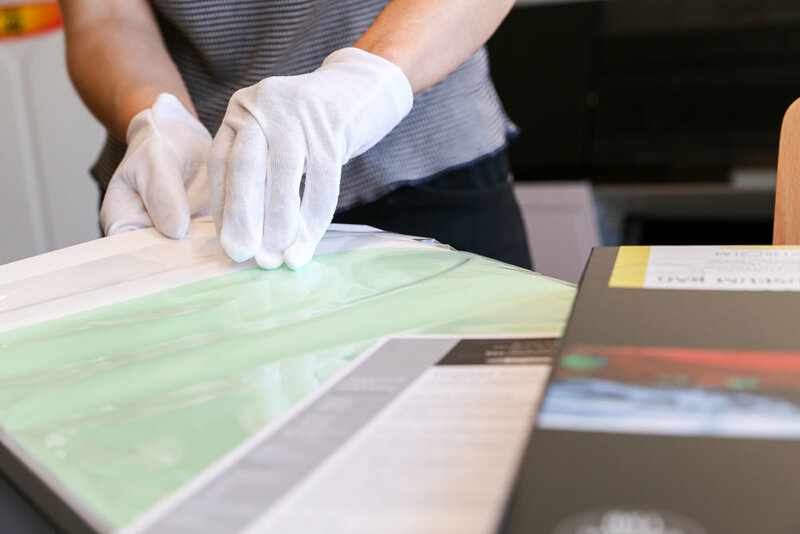 Anything up to A2 is packed flat in an archival mylar sleeve with our 1500ums backing board and can then be shipped in specialty A3 and A2 flatpack mailers specifically designed for artwork. 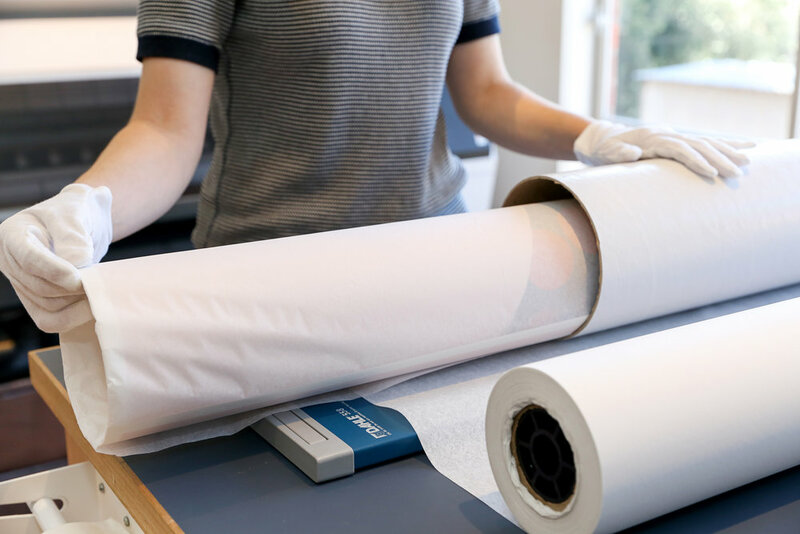 For works larger than A2, the piece comes rolled in archival tissue paper and carefully placed in a rigid tube for ease of transportation or shipping. The quality of our printing is only as good as the files we receive. For basic file setup instructions, please view our file setup guides. 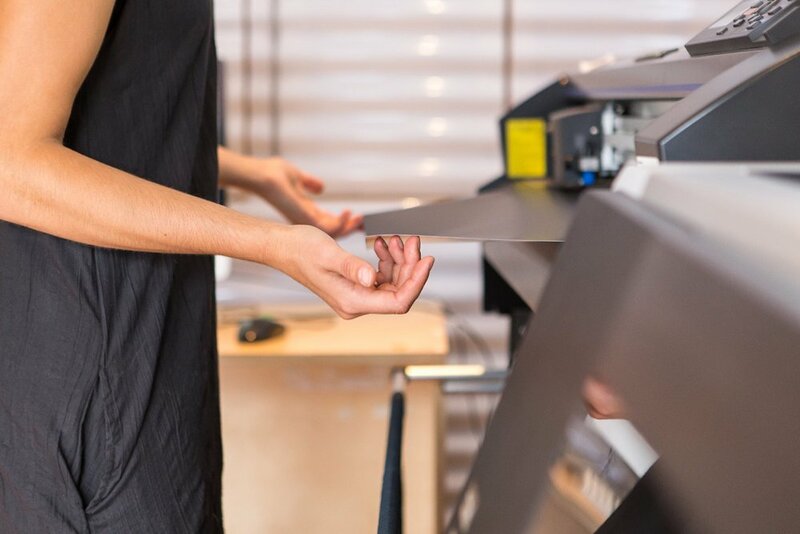 If you require a wider variety of stocks, or more hands-on support with file setup, please contact us and we can refer you on to other local printers in the area who may be able to assist. Our pricing table is shown below. Prices are ex-GST. Sheet printing does not include bleed. If your work requires bleed, then it must be printed on the next sheet size up, or on a roll in multiples. For larger quantity orders, 50 and above, please get in touch for a detailed quote. Current turnaround times are between three and four business days from receipt of file. Payment in full is required before dispatch of goods. We accept all major credit cards, EFT, Paypal, and Cash.